Last month I used the ABC’s to teach children how to shape their turns for speed control. This month I’ll try to help intermediates get out of the rut and make better turns. To suit the higher ability level, I’ve moved the analogy from grade school ABC’s to high school Geometry. When I work with intermediates, I try to get them to think of their boots as being square instead rounded. In past we’d tell students move your shins directly forward into the front of the boot. Now, with modern technique we want to move those shins diagonally into the corner of our imaginary square boot tops. If you tip both shins in the same plane into the corner of the square box (top of your boots) the skis will roll up on edge. Start by tipping your shins into the uphill corner of the square on the bottom half turns (after the apex). Try a gentle green trail and notice how your skis respond. As you gain confidence with this move try to gradually push toward the corner earlier in the turn. 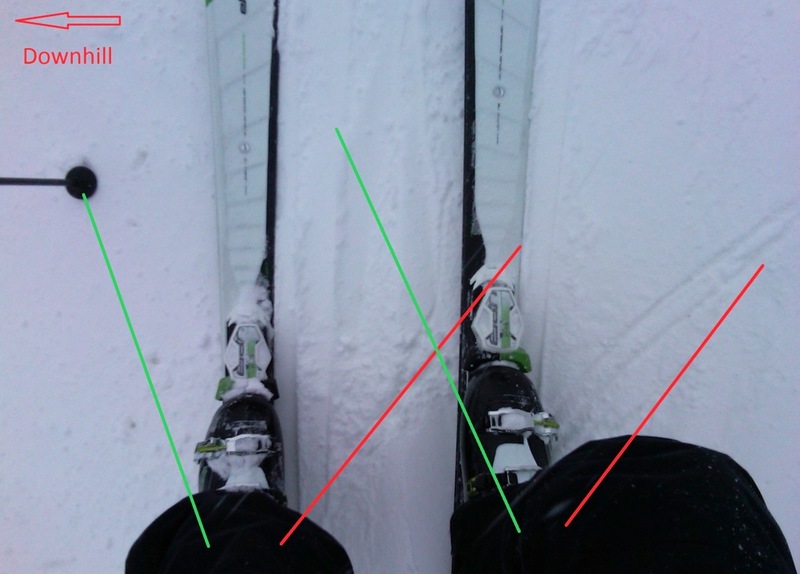 Not only are the skis parallel, but the planes that the shins tip in are parallel. This leads to the leg angles that are parallel too. The goal is to start the turn by tipping your shins into the downhill corner of the boot box at the very beginning of the turn. Do this before twisting or turning your body or legs to get the skis on edge, and then just gently guide the skis where you want to go through the turn. This will take a lot of practice on easy trails to get the hang of it, but it will pay off. Sports physiology says that getting a new move into muscle memory takes 500 to several thousand repetitions of perfect practice depending on how engrained the old move was. Once you’ve mastered the basic move you can add in a pole touch. Draw an imaginary line in the plane that your shin is going to tip in the boot box and touch your pole along that line. As you reach out with the pole feel that imaginary line pulling your shins with it into the turn. The arm and shin move in concert not in a one – two type move. Don’t try to take this to a harder slope until you have mastered it on an easy one. Intermediate skiing is all related to geometry. Next time we’ll get into the “physics” of advanced skiing. This is great! I’m looking forward to not only practicing this, but figuring out what my shins currently do during a turn. Most recently I’ve been focusing on where my upper body tends to lean. Should I mimic this movement with my hips/torso? I’ve found in 24 years of teaching that focusing on the tipping shins really helps intermediate skiers. As you progress with this move you can move it up the body and this is what I’m talking about with the pole touch being on a line pulling your shins into that corner. As you reach out with the pole this moves your center of mass which moves your shins as one whole movement – not a one -two type movement. For this to work its really important that you also focus on not rotating your upper body. At the intermediate level the upper body needs to stay quiet so that they legs can work under well. So clean and simply stated. The graphic is very obvious.